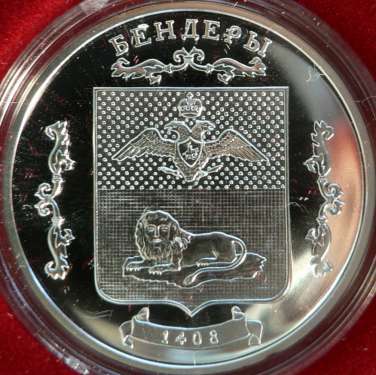 The coin represents the coat of arms of the city of Tighina (Bender) from the period of the Russian occupation of Basarabia. It belongs to a series comprising coins with coat of arms. 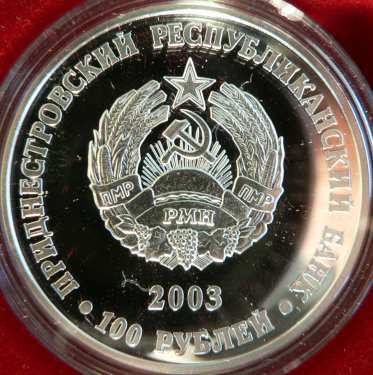 From the same series are the coins with the coat of arms of the cities of Tiraspol, Grigoriopol and Rîbniţa, all three placed in Transnistria, on the left bank of River Nistru. Tighina is also a village situated on the right bank of Olt River, in the county of Vîlcea, Walachia, Romania. After the occupation of Basarabia at 1812, the Russian authorities settled the coats of arms of the region and of the counties. 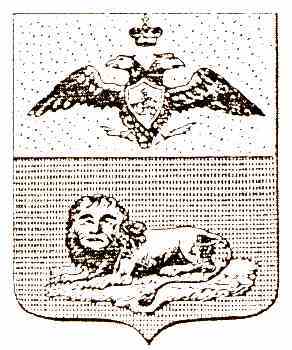 Inside the Russian Empire the coat of arms were administrated by a dedicated institution, Heroldia, created by Peter the Great at 1722). The Basarabian coat of arms were settled by the imperial decree of czar Nicholas I from April 2nd 1826. The coat of arms of the Bender county was: "Shield split in two fields: inside the upper one, on gold, the two-headed eagle adorned with golden crown, holding in both talons lightnings with the fire pointing down; with shield on chest, on which in red field Saint Great Martyr George, the bearer of victyory, is represented on white horse and striking the dragon with the spear; in the black lower field a sitting lion is represented, in memory of the difficult situation in this region of the Swedish king Charles XII after the battle of Poltava." 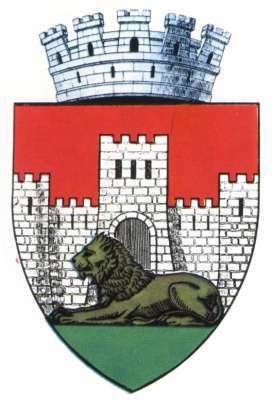 The Official Gazette number 182 from August 8th 1931 shows that the coat of arms of the city of Tighina is a silver stronghold with three crenulated towers, in front of which lies a golden lion to the right, sitting on a green terrace. The tower in the middle is taller that the other two towers and has a closed arched porch. The windows of the stronghold are black. The shield is adorned with a silver mural crown with five crenulated towers, with black windows. The stronghold on the coat of arms is, obviously, the fortress of Tighina. The lion stands for Charles XII, the king of Sweden, that took refuge in the raya of Tighina in 1709, after losing the battle of Poltava against the armies of Peter the Great, the emperor of Russia. The lion itself is a king, but moreover it is also an important charge of the Swedish coat of arms. The Russian version of the city's coat of arms depicts it clearly isolated on a terrace. The main character from the novel "The Little Golden Calf", written by the Russians Ilf and Petrov, is named Ostap Bender. In Russian, the name Ostap Bender became a metonym for con man. In search of an exotic name for their famous to become character, Ilf and Petrov found a toponym from the former gubernia of Basarabia and used it, more precisely the Turkish name of the city of Tighina, adopted also by Russians after the occupation of 1812 - at the border between Romania and USSR at the times of the book issue -, name also present on the coin. The misanthropic antihero Ostap Bender managed to obtain, by blackmailing a NEP-man (an enriched of the Soviet New Economic Policy), no less that one million roubles - about ten thousand monthly mean salaries in the Soviet Union of the years 1930. Ascertaining that he could not use his new fortune at will in the Soviet Union, Ostap Bender bought jewels and tried to flee to Rio de Janeiro. He ran away from USSR, crossing river Nistru - the western frontier - to Romania on ice. The Romanian frontier guards caught him. Ostap thought that the Romanians could be bribed with one or two golden medals. But the guards took all his treasure and Ostap Bender being forced to return on the left bank of river Nistru. It is worth mentioning that, as he met the Romanian frontier officers, Ostap Bender greeted them with "Trăiască România mare" (Long live great Romania! ), in Romanian, in original.